making huge money selling physical products has just become drop dead easy! learn how you can leverage one of the most popular online marketplaces available on the Internet. Now you can set up your own store that stocks the hottest selling products and make lots of money doing it. The best part is that amazon has done most of the hard work for you! Selling physical products on the Internet can be a daunting task. Let me take you through it by the numbers to explain what I mean by that. First - Choosing a Hot Selling Product. If you do this wrong you will put yourself in a world of hurt! You absolutely have to get this right or you are sure to fail. You will have wasted your time and your money. Second - Find a Reliable Source To Supply Your Products. This one can kill your business too. If you find a hot selling product and have buyers waiting but nothing to sell them then again you are in a bad position - not to mention you look like an idiot for trying to sell something you don't have. 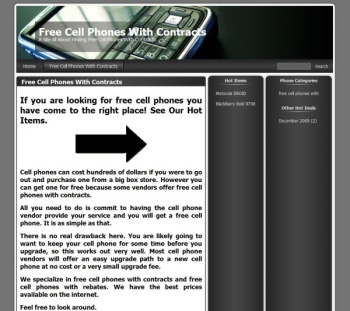 Third - Find a Reliable and Reasonably Priced Source To Deliver Your Products. You want your customers to get their products in a timely manner and be able to charge a reasonable fee for shipping. Get this wrong and you have more trouble coming your way. Fourth - Customer Service and Product Warranties and Returns. Customer service is the backbone of any business. You must be able to answer questions and look after warranty work and product returns to keep people happy. Fifth - Cross Promotions and Upsells / Downsells. This is where the big money is. If you aren't doing this then you are leaving huge sums of money on the table. Those are just some of the highlights. There is a lot more to it. But I can show you how to eliminate all of these concerns. The answer is to become an affiliate at Amazon rather than try and do all the grunt work yourself. Let the professionals handle it. You just send targeted traffic to products that are proven to sell. It is not as hard as it sounds and that is what I am going to show you in this video series. Amazon has literally looked after everything on this list. All you have to do is put all the pieces together. Much of this happens by itself behind the scenes however there are a few things that you have to do yourself to ensure success. First of all - you must choose products that are proven to sell and secondly you must build a site PROPERLY so that people will find it and want to buy from it. This is the site I built during the recording of this video series. It is fully search engine optimized. 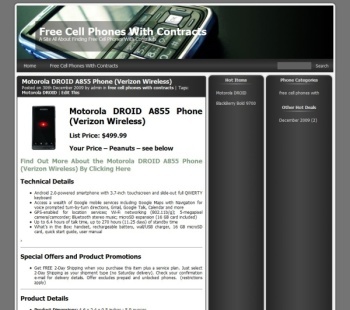 You can build GREAT looking, search engine optimized sites like this in less than an hour. No experience necessary! Now is your chance. 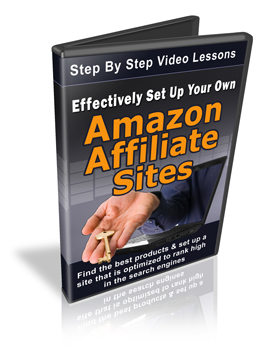 This video series is going to show you everything you need to know about setting up effective Amazon Affiliate Sites. All you need to do is get started. Your Purchase Is Backed By My 60 Day 100% Satisfaction Money Back Guaranteed!